When planning a party you want to be sure of a few things—the venue has been selected, the invitations have been sent, and the food and drinks are planned out. Most parties consist of the same aspects and can be organized similarly, but some could be improved with a simple addition. Catering can take a party and amp it up, offering delicious food that is more unique than the typical sandwiches and potato salad. Some parties may not need catering, like your child’s first birthday party, but other events could be greatly enhanced with catering that your guests will love. 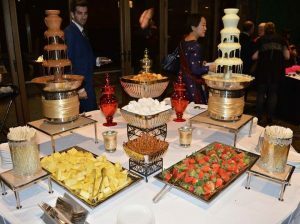 At Baba Ghannouj Mediterranean Buffet, we offer delicious and unique catering that can give your party some extra spice. From buffet style catering to pita wrap party platters, we can provide your party with amazing options! But we understand that you won’t need catering at all of your parties or events. In this blog, we will go over some of the celebrations that are perfected with catering! A graduation, whether it is high school or college, is a special event. Your child has worked hard throughout school to get to the point they are at now and they are ready to start the next chapter of their lives. This should be a celebrated moment and be special for them. Getting their graduation party catered can allow you to relax, spend some time with your graduate, and provide their friends and family with great food. A college graduation is a big deal and definitely deserves to be catered. Your child has finally finished school and isprepared to head into their career, be completely independent, and start their own lives. Celebrating with their best friends, family members, and gyros is a great way to send them off into the real world. Unless you have a small family, getting your family reunion catered is an easy and fun way to spend time with loved ones and have delicious food. Sure, you could have each family member make a dish to share with everyone, but you may end up with three different attempts at your mom’s famous macaroni salad, in which case, the food results are disappointing. Catering for a family reunion allows you and your siblings, aunts, and uncles to enjoy some delicious food while reminiscing and catching up. No need to worry about who brought what, or avoiding what uncle Jerry made because it is most likely inedible, instead you can simply eat and enjoy family company. If your company’s annual event is a picnic in the Research Triangle Park, then Baba Ghannouj is the perfect catering company for you! We are located in the area and can supply delicious food for your company picnic. Company events are perfect to have catered. Your employees will feel appreciated and be glad that they don’t have to worry about providing the entire crew with food or snacks. Catering allows you to get enough delicious food while your employees mingle and get to know each other. Having a caterer also brings a sense of professionalism and can show your employees that you wanted to provide them with delicious food. If you are throwing a company event, catering is the best solution, and Baba Ghannouj offers tasty and authentic catering options. Whether it is your 20th, 30th, or 60th anniversary, you deserve to celebrate. Host a party, or ask someone to host one for you, to celebrate your years of love. If you are hosting your own anniversary party, you don’t want to spend time worrying about food and ensuring there is enough for everyone. Catering can make this celebration easier for you and your guests. Perhaps your third date was at Baba Ghannouj, this would make our delicious food both meaningful and perfect for your anniversary party. Get your favorites and enjoy spending time with friends, family, and your loved one while chowing down on delicious food. If you have finally retired, it is time to celebrate. After retiring, the last thing you want to do is worry about providing food for the people celebrating with you. Plan for catering or tell the party planner that you want something easy but delicious, and maybe even suggest Baba Ghannouj! After spending years of your life working, the best thing to do is celebrate your retirement. Delicious food, great friends, family, and a celebratory drink is the perfect way to end your career. Catering is the best option for a retirement party, allowing for you to relax and enjoy the exciting day. With the first football games right around the corner, you will want to host a season opening kickoff party to celebrate the beginning of the best time of the year. Invite all of your buddies, stock up on their favorite beverages, and get delicious food. Unless your wife, brother, or neighbor is present and enjoys cooking over football, catering is the best option for you and the dudes. Celebrating your team with amazingly tasty meat trays and football fanatic friends is a great way to kick off the season. We can cater the best football food for you and your buddies, allowing you to enjoy gameday like a true fan. Whether you are new to the neighborhood or have lived in the same house for 20 years, a neighborhood block party is a great way to reconnect with neighbors, meet new friends, and spend some time outside. While barbecuing is fun, being able to relax and not leave the task of cooking to one person is a better decision for this type of event. Get buffet style catering from Baba Ghannouj and allow everyone to find something they love. This is a great way to become better friends with your neighbors and have a reason to have delicious food catered! Catering is great for just about any event. With catering you don’t have to rely on your guest to bring a side, dessert, or beverage. It can save you time and money. And catering can provide your event with delicious and unique food that your guests will love. The next time you are planning an event, give Baba Ghannouj Mediterranean Buffet a call! We can help improve your party and allow you to enjoy it as well! Check out our catering menu and start planning your party with catering from Baba Ghannouj! Contact us today with any questions you may have and stop by to enjoy our lunch or dinner buffet and get a taste of delicious Mediterranean cuisine!